This analysis seeks to provide balance to the claim, made frequently during the EU referendum campaign, that 3 million UK jobs are linked to trade with the EU. By a method similar to that used in calculating the 3 million figure, we provide a new estimate for the amount of UK jobs linked with exports to EU countries and, for comparison, estimates of EU jobs linked to exports to the UK, on a country-by-country basis. An estimate of the decline in UK-EU trade as a proportion of GDP is also included, as this will likely have a knock-on effect on the number of jobs in the UK linked to UK-EU trade. As UK exports to the EU decline, so will the proportion of UK jobs linked to trade with the EU. Our estimates are followed by a short commentary on the potential impacts of new trading relations and the exchange rate, contributing to the view that the UK is likely in a better position to adapt to changes in trading terms with the EU than other members of the EU. Our analysis shows that, whereas 3.6 million UK jobs are linked with exports to the EU, 5.8 million EU jobs (excluding the UK) are linked with EU exports to the UK. 22 of the 27 remaining EU member states have more jobs linked with exports to the UK than the UK has linked with exports to those member states. In the case of Germany that is 1.3 million jobs linked to exports to the UK, for France it is 0.6 million jobs and for Italy 0.4 million jobs. For the UK, exports to Germany account for only 0.8 million jobs, France 0.5 million, and Italy 0.3 million. Each of the 27 remaining EU countries has a higher proportion of jobs linked to UK trade than the UK has linked to trade with that EU country. For the 27, UK trade accounts for between 1.5 and 9.5 per cent of jobs whereas, in the UK, each EU country’s trade accounts for between 0.0 and 2.4 per cent of UK jobs. German trade accounts for 2.4 per cent of UK jobs, but UK trade accounts for 3.2 per cent of German jobs. UK exports to the EU accounted for almost 50 per cent of UK exports in 2005, declining to around 42 per cent in 2015. The projections then show that by 2020 the EU could account for 38 per cent, falling to just 29 per cent by 2035. In terms of the proportion of UK exports by trading partner, major EU member states’ (France, Germany, Italy and Ireland) shares of UK exports are declining gradually. The impact of this decline will likely be reflected in the share of the UK jobs market linked to EU trade. The share of exports going to the EU could fall at a faster rate than currently seen if the EU continues to fail to secure major new trade deals and the UK is successful in building new trading relations on exiting the EU. In addition, the adjustment in the value of sterling following the referendum may lead to an increase in domestic and overseas demand for UK products. The potential risk to jobs from less favourable UK-EU trade terms is more likely to be realised in the EU than the UK, as UK exporters will benefit from increased global competitiveness unlike the EU. Our analysis, shown in Table 1, estimates the jobs linked to EU-UK trade based on the most recently available EU employment and GDP figures, and the ONS Pink Book data on UK exports and imports in goods and services for 2015. The number of individuals employed is used as an estimate for the number of jobs. To reach these estimates we have calculated, for each EU country, the value of exports to the UK as a proportion of each country’s GDP and then assumed that an equivalent proportion of each country’s currently employed population has jobs linked to exports to the UK. Though this is a rough estimate due to variations in productivity and employment between and within sectors, it provides some sense of scale as to the proportion of jobs in EU countries linked with exports to the UK. Similar methods, applied to the EU as a whole, led to the claim that around 3 million UK jobs are linked to exports to the EU during the referendum campaign. In our analysis, for the UK the same calculation is made for each of the remaining 27 EU countries, calculating exports to each EU country as a proportion of UK GDP and applying this to the number of people employed in the UK. More detailed estimates by the Treasury have been conducted using the number of jobs linked to exports in each sector. However, because the country-to-country data on exports and employment by sector is limited, we rely here on aggregate exports in goods and services. This analysis also takes into account the ‘Rotterdam Effect’ (the fact that a great deal of the Netherlands’ trade merely records the transport of goods bound for non-EU destinations). It is estimated that 50 per cent of UK trade in goods with the Netherlands can be accounted for by this effect. It is important to adjust for these figures, as the jobs related to the manufacturing of these goods are likely based on trade with countries outside the EU. The impact of this is to reduce UK jobs associated with Netherlands trade by approximately 140,000 and to reduce Netherlands’ jobs associated with UK trade by approximately 270,000. The adjusted figures for the Netherlands are included in the tables in italics. Table 1 provides a country-by-country comparison of UK jobs and the jobs in each of the remaining EU countries linked to EU-UK trade. The table shows that, whereas 3.6 million UK jobs are linked with exports to the EU, 5.8 million EU jobs (excluding the UK) are linked with EU exports to the UK. In the case of Germany that is 1.3 million jobs linked to exports to the UK, France it is 0.6 million and Italy 0.4 million. The second column shows UK jobs linked to exports to each remaining EU member state and the fourth column shows for each member state the jobs linked to UK bound exports. For each EU partner country the column showing the higher number of jobs linked to these exports, either the UK or the partner country, is shaded red. Most remaining members, with the exception of Ireland, Denmark, Finland, Luxembourg and Malta, have more jobs linked to exports to the UK than the UK has linked to exports to that country. As such most of the remaining EU member states, representing over 95 per cent of the post-Brexit EU population, have more jobs exposed to UK trade than the UK has exposed to that member’s trade. The third and fifth columns give these values as a percentage of each country’s jobs, or employed populations. 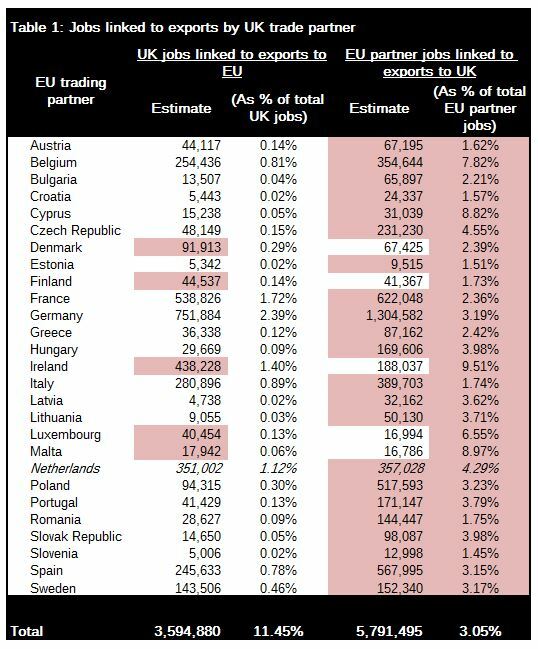 Again, for each EU partner country the column showing the higher proportion of jobs linked to these exports, either the UK or the partner country, is shaded red. Each of the 27 remaining EU countries has a higher percentage of their workforce in jobs linked to trade with the UK than the UK does in jobs linked to trade with that country. This means that each of the remaining EU countries has a higher proportion of their workforce employed in jobs that are linked to UK trade than the UK has with each EU country. Based on the potential impact on jobs, each EU country should be aware of the significant economic benefit in terms of jobs stemming from trade with the UK. The EU does arguably have to negotiate as a bloc. However, each of the 27 remaining national governments, with between 1.5 and 9.5 per cent of employment linked to UK trade, should be negotiating in the interests of those that democratically elected them. Further still, the EU has a net of 2.2 million more jobs linked to UK trade, and the Eurozone is still struggling with a highly unbalanced economy and recovery following the 2008 crisis, so all parties should be considering the economic impact during exit negotiations. The UK, as discussed later, has an increased competitive advantage which will allow it to do more to help UK business export outside the EU which can help offset exposure to a change in trading terms with the EU; the EU does not have such a luxury. It is worth remembering that the job numbers calculated here do not reflect any likely job losses or even the number of jobs at risk due to the UK’s vote to leave the EU. It is a reflection of the number of jobs linked to UK-EU mutual trade. Any actions that significantly hamper trade will likely then put pressure on jobs in countries’ exporting sectors, but a level of UK-EU trade will continue regardless of the terms of the UK exiting the EU. Table 2, below, contains data from Eurostat and the ONS Pink Book 2016. 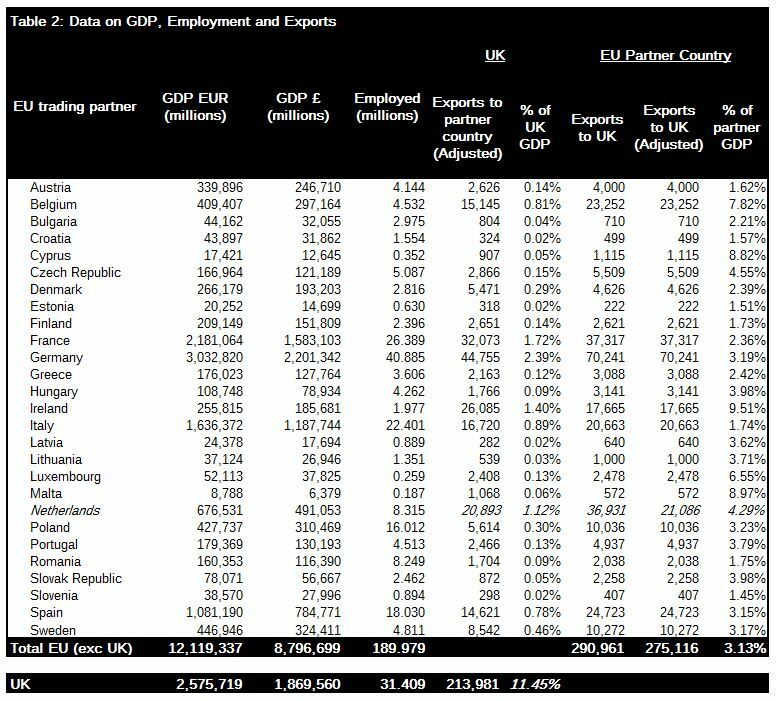 It includes the figures on employment, GDP and UK-EU trade used in calculating the estimates in Table 1. Our analysis in Table 3, based on a previous briefing note by Global Britain and ONS data, shows the current downward trend in the proportion of UK exports in goods and services going to the EU, and, using data from 2005 to 2015, creates projections for the proportion of UK exports going to the EU in 2020, 2025 and 2035. 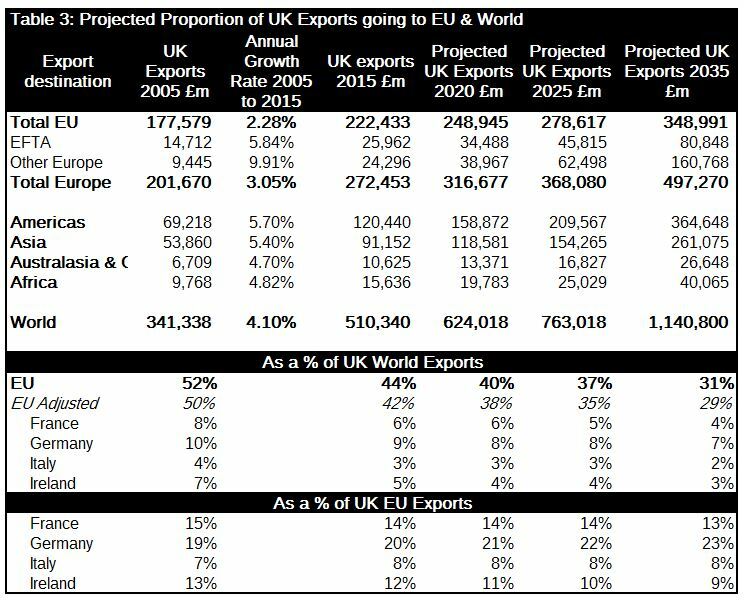 Our projections are based on the compound annual growth rate of UK exports by country and region. This growth rate, which reflects the decline of the EU as a trading partner over the last 10 years, is used to estimate what proportion of UK exports will go to the EU in the subsequent 5, 10 and 15 years. Data shows that UK exports to the EU accounted for almost 50 per cent of UK exports in 2005, declining to around 42 per cent in 2015. Our projections then show that by 2020 the EU could account for 38 per cent, falling to just 29 per cent by 2035. The table also shows major EU member states’ (France, Germany, Italy and Ireland) shares of UK exports decline gradually. We again take into account the Rotterdam Effect, giving the EU adjusted values using the same method as above; reducing the proportion of goods exported to the Netherlands by 50 per cent. The impact of this decline will also be reflected in the share of the UK jobs market linked to EU trade. It reflects a trend of decreasing importance which will be ever more notable as the UK reaches out to trade more globally. It is worth noting that if the EU continues to fail to secure major new trade deals and the UK is successful in building new trading relations on exiting the EU, the share of exports going to the EU could fall at a faster rate than currently seen. The EU appears to have stalled in signing new trade deals, so remaining members of the EU will struggle to build new trading relations, especially as the UK is one of the EU’s biggest proponents of free trade and is now leaving. However, as any change in UK-EU trading terms comes into effect, the UK will be able to start building new trade relationships with other countries, reducing the cost of imports from outside the EU by lowering tariffs and removing import quotas, while seeing the cost of exporting from the UK to new partner countries fall. This ability to set country specific trade policy will give the UK the advantage of flexibility following its departure from the EU. EU countries will likely remain less competitive for UK importers and potentially see damage to the level of EU exports coming to the UK. Further still, the adjustment in the value of sterling following the referendum may lead to an increase in domestic and overseas demand for the UK. The effect will be fairly immediate and will help support UK exporters, who have seen a boost in exports in August. This is also likely to be already putting pressure on the EU, potentially reflected in the surprise decline in the German PMI. As such the exchange rate could also be putting pressure on EU jobs and supporting UK jobs, so the potential risk to jobs from less favourable UK-EU trade terms is more likely to be realised in the EU, as UK exporters will benefit from increased global competitiveness from a lower exchange rate, unlike the EU. The combined impact of a lower exchange rate now and an independent trade policy in the future will equip the UK with the tools to increase its global trade, boosting its exports and helping to reduce the cost of global trade on leaving the EU. This will leave the UK better equipped to support business following its departure from the EU than our current EU partners. To do so the UK government should make it clear that the current exchange rate reflects a fair value for the UK economy and that following its departure from the EU, on any terms, the government will pursue an aggressive policy of improving global trade relations, whether through trade deals or through reducing tariffs and removing quotas on imports. Along with this the UK government should stress the importance of the UK economy to individual members of the EU. Following the referendum campaign, the UK has been left with the impression that it is only the UK that will suffer if there are unfavourable exit negotiations. The truth is that the individual members of the EU have as much, if not more, at stake from damages to their UK trading relations. Justin Protts is a Civitas Research Fellow. He can be emailed at justin.protts@civitas.org.uk and tweets @Justin_Protts.